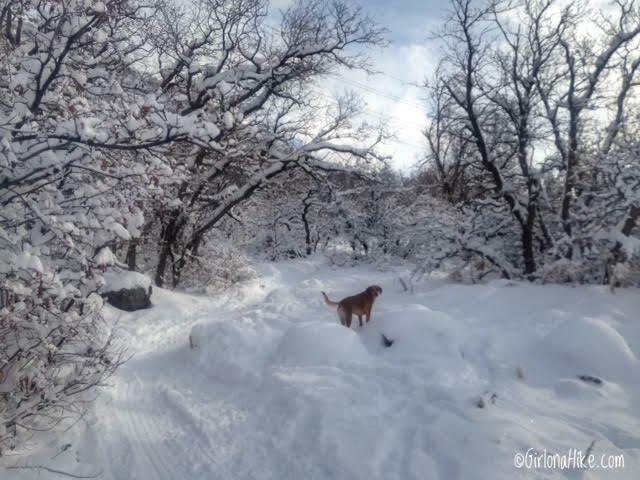 Although this trail is dog friendly, every time I have gone at least one person has told me to grab Charlie aside. 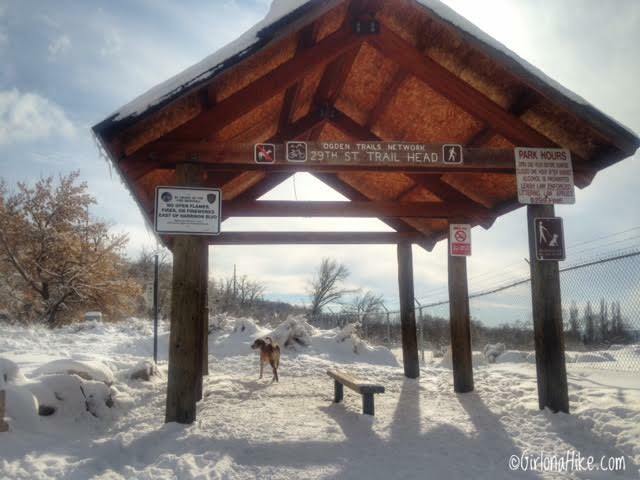 Not sure why it's only this trail that people aren't as dog friendly, but they are allowed off leash. 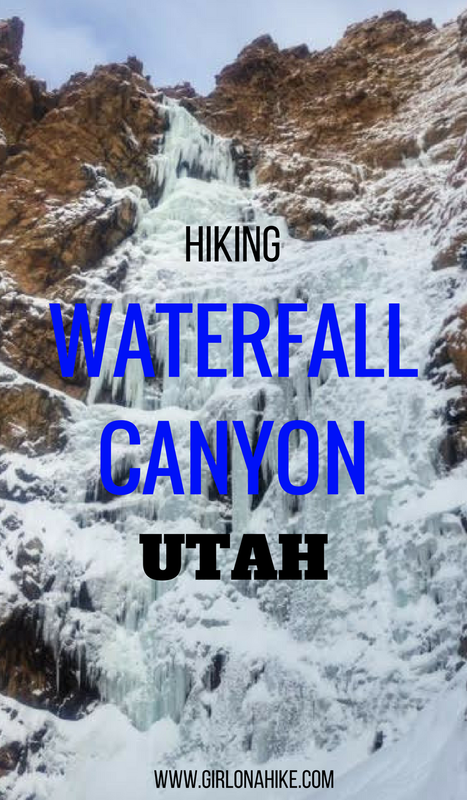 There were was also a large incident of vandalism in Waterfall Canyon in 2015, which is on private property. 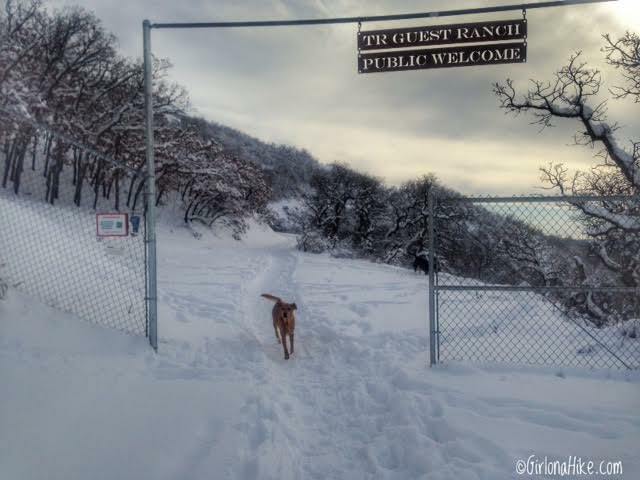 The owner tried to combat this by requiring the public to hike with their ID (read the article), but nobody was asking for an ID when I hiked it in December 2016. The last 3/4 mile of this trail is rocky and steep, so hiking poles are very helpful, especially for hikers with bad knees or hips. It's also advised that you don't climb any of the surrounding cliffs - a few people have died in the past attempting to do so. In summer this trail can get pretty hot, but the stream does flow year-round and dogs can easily drink from it. From SLC, head north on I-15 then follow HWY 89 north. Turn right on Harrison Blvd. Drive another 4 miles, and turn right on 30th street, left on Polk Ave, and an immediate right on 29th street. Drive to the very end of the road and turn right into the large parking lot. There are no restrooms. Here is a driving map. You'll know you are at the correct TH when you see this little pavilion marked, 29th Street TH. 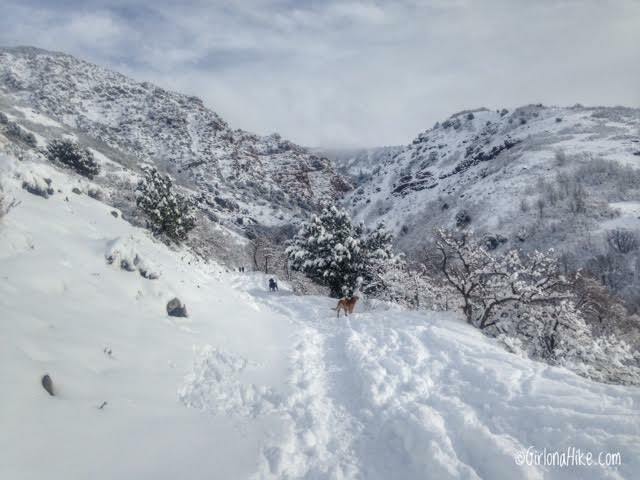 After hiking under this, immediately turn left following the signs for Bonneville Shoreline Trail (BST). Continue following the BST signs uphill. 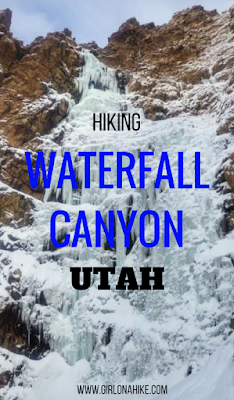 Eventually the trail turns East and you'll get your first view of Waterfall Canyon. 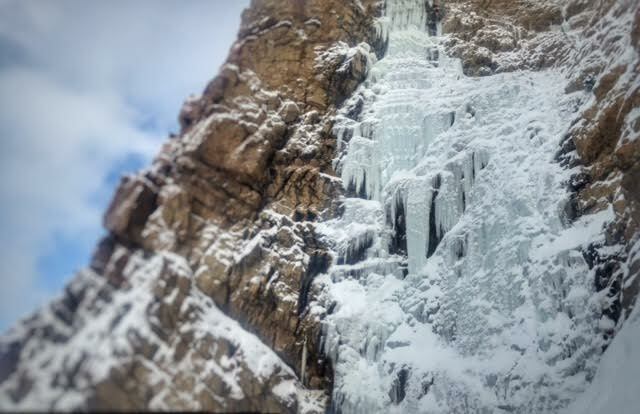 The waterfall itself is still tucked around the cliffs. Cross bridge #1. 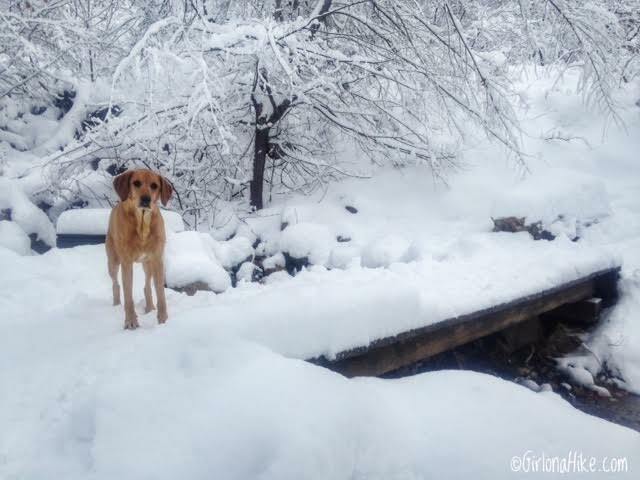 This is also the first spot where dogs can easily get a drink of water from the stream. Right after bridge #1, take an immediate left. 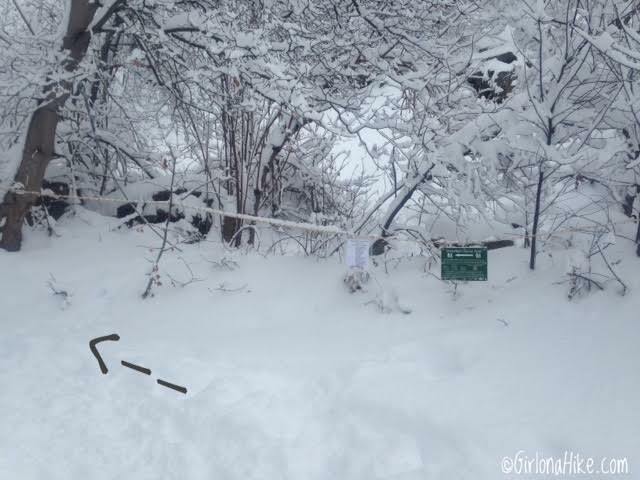 Don't miss the sign - otherwise you'll hike in the wrong direction. Cross bridge #2 - just after this bridge is where the trail begins to get even steeper. Have your 4 Must Have Items for Winter Hiking with you! 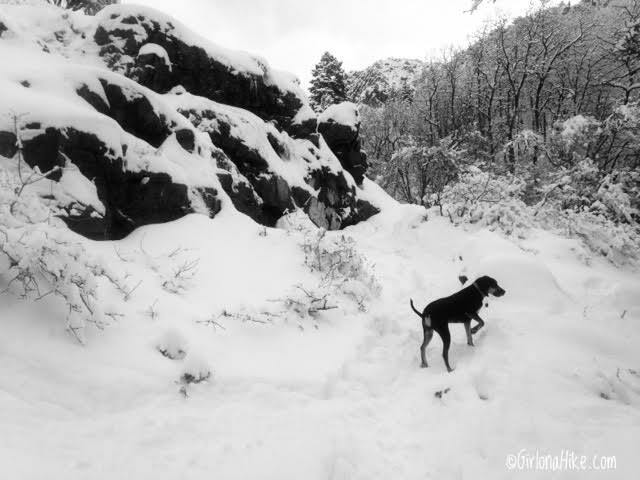 Copper, a Blue Tick coonhound, leads the way. 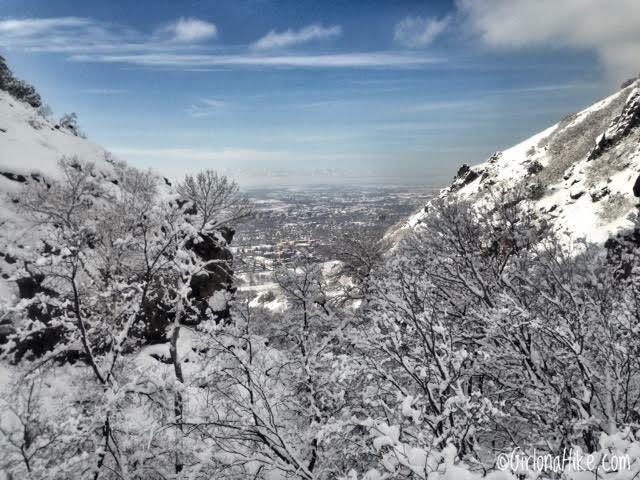 Don't forget to look back down the canyon - you will have a great view of Ogden, UT. Ahh, the first view of the waterfall! 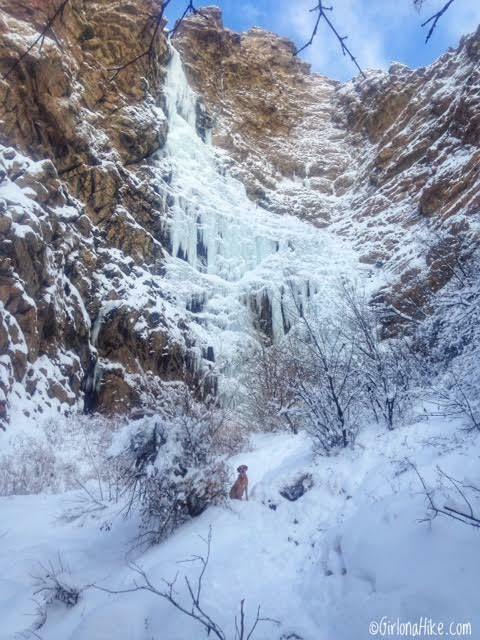 Charlie and I strike a pose in front of this massive frozen waterfall! 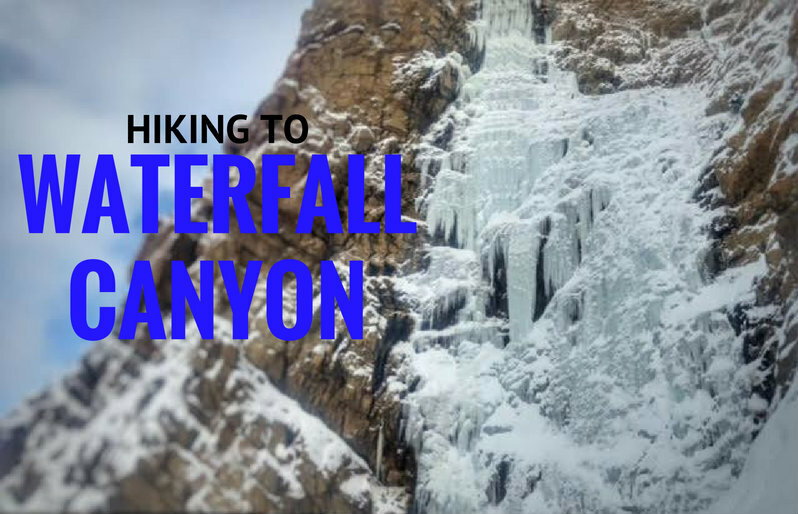 As you look around the waterfall area you'll see a bunch of cables hanging across each side of the canyon walls. These are for the newly developed zip line. In my opinion, this is probably contributing to the vandalism and crack-down on rules in this canyon. My vote is to take down the cables and leave the canyon in its natural state. 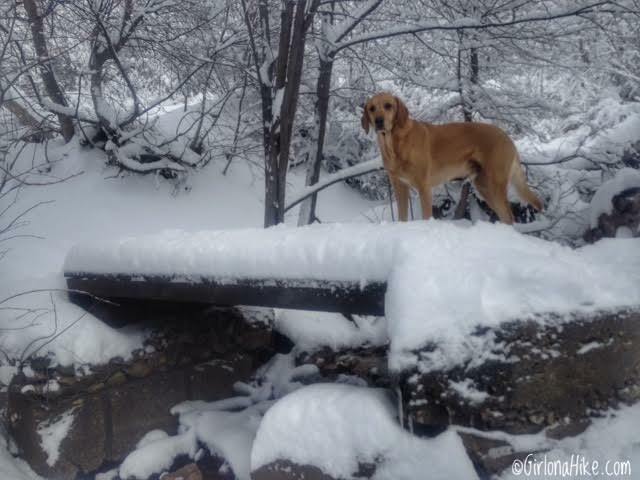 This photo was taken February 2015 - it shows just how dry of a winter we had that year. Crazy the difference! 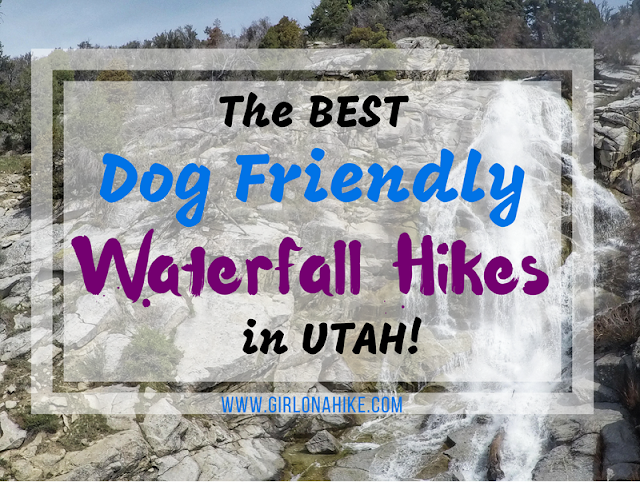 The Best Dog Friendly Waterfall Hikes in Utah! I love this! 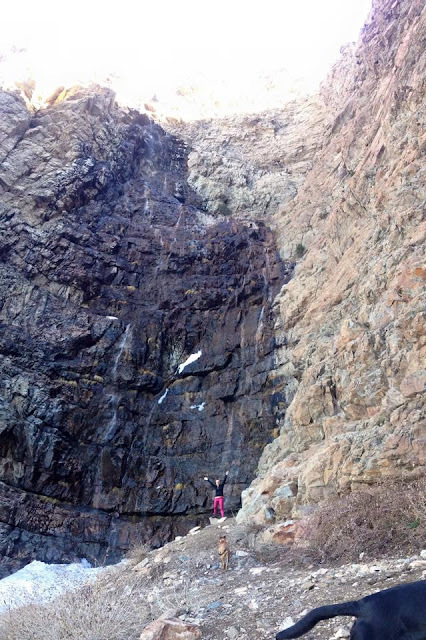 The waterfall is gorgeous and would be amazing to climb up! We went on this hike on Labor Day. DON'T ever do this!! Haha! There were literally over 150 people (the parking lot was FULL of 15-passenger vans!) We had to pull off many, many times to let huge groups pass. Perhaps not a holiday again! Trail was sooooo dusty (because of this terribly dry summer) and full of garbage and dog poop :-( . The falls were cool when you got there, but about 75 people up at the top with us, ha! 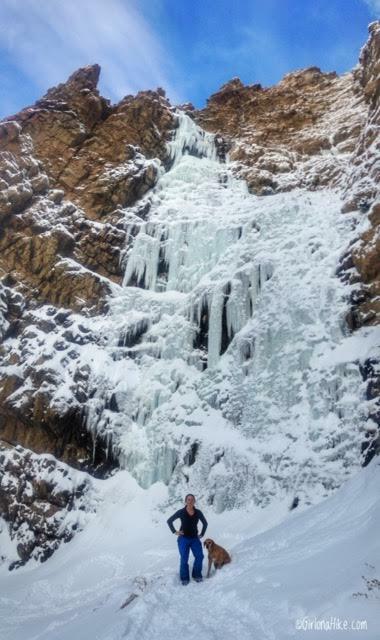 Can't wait to try again next year on a weekday AND in June, like our friend who showed us a photo of her up there in June and the falls were gorgeous. Just thought I'd tell you also that a man came by on an ATV and threatened to give us a ticket for our dogs off leash. He told us that it is private property and dogs must be on a leash?? It also is posted on a sign that dogs must be on a leash. Maybe when you went in the winter it may have not mattered, or on a week day? Possibly because it was a holiday and so crowded? Thanks for all your posts and research. Do you have to wear spikes during the winter?